Learn About the Flow of Prana Through Your Poses. Are you ready to deepen your experience of yoga? To experience your poses in a more profound way? Join Tai Chi Master Ron Erdman-Luntz, for an experience like no other. This unique workshop will take you deeper into your practice. 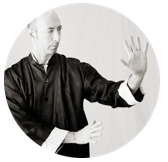 Ron will guide you into feeling your chi and get it moving through chi kung exercises. Then he will take you into yoga poses to experience the flow in the poses. Your poses will feel more grounded and aligned. Your spine will feel longer, your heart more open and the benefits of your practice is exponential.